A BECMI Character Created with Labyrinth Lord using Rules Cyclopedia straight 3d6 method. 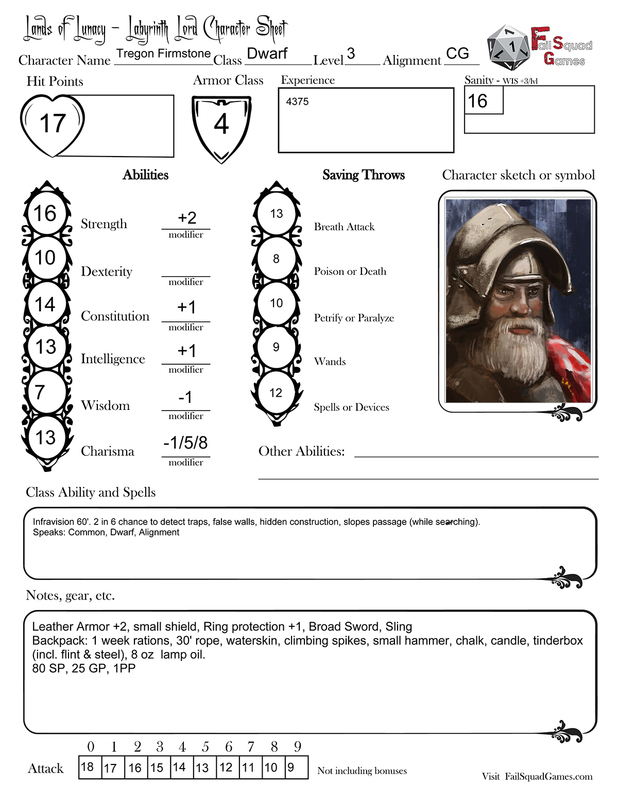 Tregon is no stranger to heavy armor and hard battles, but prefers the quiet movement of his fine leather. Tregon is a hardy, solid dwarf of good reputation among his kin in the mountains. He works hard, is likable, with a good humor. He always sees the best in folk and sometimes to a fault. He can be quite gullible. Trevon believes most things that people say are the truth, and has lost his savings more than once because of his blind trust in others. Tregon prefers the home life. His mother’s Sweet potatoes and onions makes up his favorite meal. He has come to admire halflings for their enjoyment of good food and drink and never misses an opportunity to visit them when he can. While he loves home life under the security of the mountains, a wanderlust occasionally takes hold of him and his curious nature keeps him from holding a life-long work in the dwarven society.